Yesterday morning, while quietly reading a fun little mystery written by Jill Paton Walsh, I was startled by screaming coming from behind our place. I hurried to the slider and out onto our deck to see what on earth was going on, only to discover two raccoons fighting just across the fence at the edge of the greenbelt. A third raccoon, with a very worried expression, was coming to investigate the screaming, just as I was. And who knew that raccoons scream? I certainly didn’t, and it was an eerie sound that went on for quite awhile. Screaming raccoon. The investigating raccoon climbed over the fence, got a close-up look at the altercation, and then took off under our deck, obviously not wanting to get involved any further. The screamer finally broke away from the other raccoon, obviously terrified, and hurriedly climbed a tree…way up into the top branches of a tall Douglass Fir. It was 20 minutes before it decided it was safe enough to climb back down. The victor ignored me watching, and gingerly walked along the other side of the fence and disappeared into the undergrowth. Screaming mystery solved, I grabbed the camera and waited for the screamer to get brave enough to come back down, and I snapped this photo as he descended. At that point, I did not go back to reading my mystery (even after such good sound effects). I had plans to meet my husband in downtown Seattle to see “BODIES…THE EXHIBITION.” BODIES is a traveling exhibition from China, which is advertised as “a phenomenal look at the phenomenon we call the human body.” It was indeed phenomenal. Through the sensitive presentation of actual whole-body specimans and individual organs, this awe-inspiring exhibition will reveal how your body works by exploring it from the inside-out. Bodies…The Exhibition examines the intricacies and complexities that lie beneath your skin through the use of a unique polymer preservation process applied to real human bodies. You will leave with a greater understanding of your own physical makeup and with a deeper respect for the machine that gives you the power of life. Both fascinating and beautiful, this eye-opening exhibition is an unforgettable experience for inquisitive minds of all ages. Bodies…The Exhibition will change the way you view yourself forever. It is impossible to visit this amazing exhibition and not be moved by it. It was a fascinating experience! I came out of there with a whole new appreciation for the beauty and complexity of the human body, and with a new resolve to take better care of myself. So, this morning I’m back to reading my pleasant little murder mystery, but after all of that, I’m not quite the same reader I was yesterday! This entry was posted in Home, Life on April 27, 2007 by Robin. Robin, I’ve been woken up out of a sound sleep in the middle of the night by raccoon screaming. Doesn’t it sound like a child being killed or something just as awful? My father had to remind me that that is also their mating sounds. Great, right? But, I can totally relate to what you describe. Bellezza, that’s exactly what it sounded like! I’ve never heard anything like it before, and it really startled me. And that screaming is also their mating sound? Yikes! We live in the city, traffic can be awful, but our home is right next to a small greenbelt. 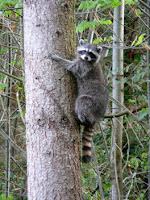 I love the birds, and watching the squirrels, and seeing the raccoons fairly often, a coyote once. Still, after yesterday’s experience, I once again realize that WE are the intruders. I didn’t know raccoons scream, and a whole family of them has lived under my parents’ deck. Wow. I loved the exhibition “Bodies”–it was here at our Natural History Museum a couple of years ago. I was pregnant at the time, so influenced by hormones it was probably more bittersweet than it would have been otherwise. Very affecting! Gentle Reader, that particular part of the exhibit is bittersweet even without surging hormones. It was incredible, but very emotional for me. All in all, it was a very powerful exhibit. I’m sure I’ll be thinking about it for a long time. I didn’t know racoons screamed, either! I heard about the Bodies exhibition on NPR and would love the opportunity to see it. Jenclair, I hope you get the chance to see it. It really is amazing. As much as most things don’t bother me, I don’t think I could go see the Bodies exhibition. Just seeing it on Casino Royale was enough for me. Carl, the Bodies Exhibition is not for everyone. We were quite ambivilent about it, and when we finally decided to go, there were only two days left before it closed. However, once there, we were fascinated.